With life so busy and time so precious, give yourself the gift of a beautiful home to relax and unwind in…perfect to share with family, friends or just for you. You deserve it and we can make it happen. 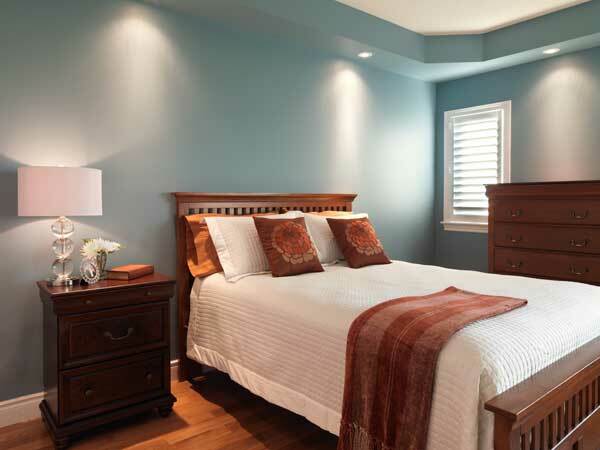 We can make your dreams come true – for your entire home, or a single room. 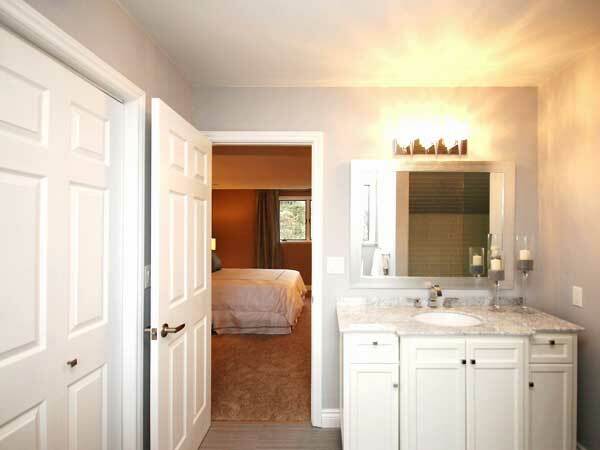 Let us offer advice and direction on beautifying your home. We will inspire you. Consultations generally take 2 to 3 hours. We also offer consultations for homeowners who want to decorate, but know that they will be selling their homes in a few years. 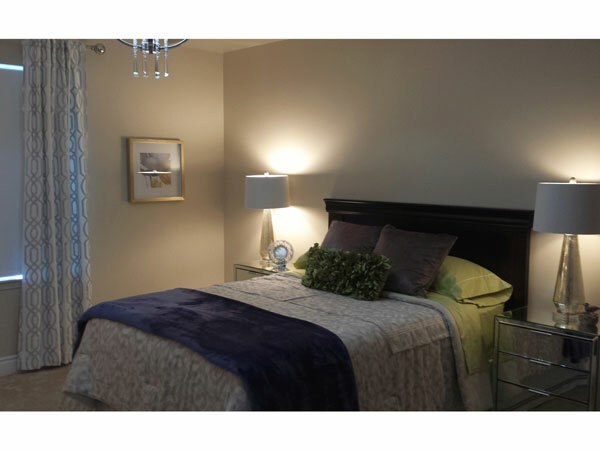 We have expertise in both decorating and staging, and can come up with a plan that will satisfy both you and any future buyer. 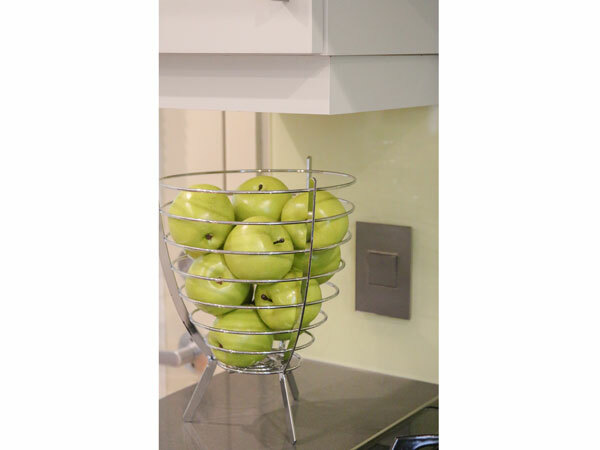 After the consultation we would be happy to help you put the plan into action. You will be amazed at the transformation! 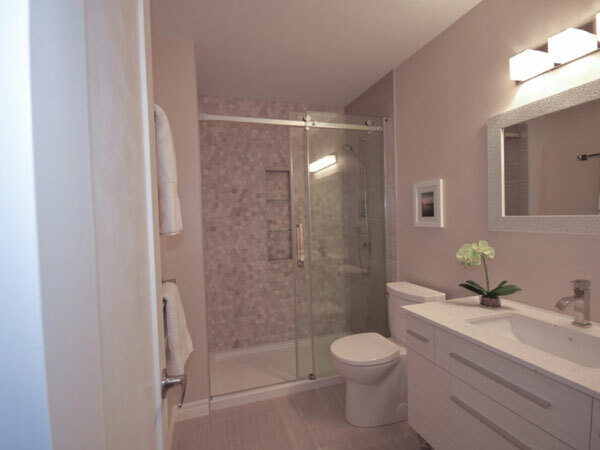 We can help you design a bathroom, kitchen, or any room in your home. Together we can make it happen. 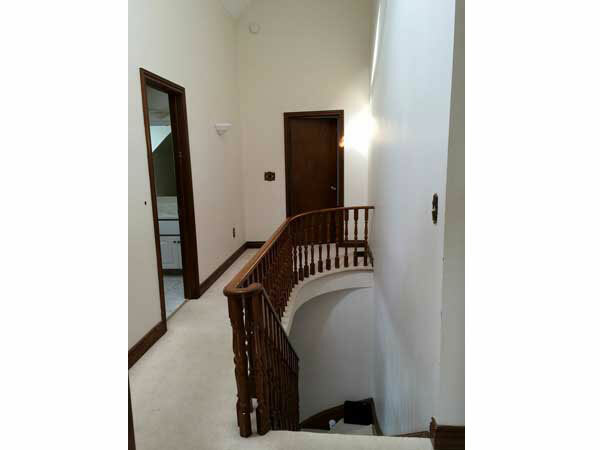 We will do drawings, source items, and provide qualified trades, while remaining sensitive to budget, timelines, and our shared, creative vision. Overwhelmed by all the decisions, and afraid you'll get it wrong? Let us make the process a more enjoyable one. 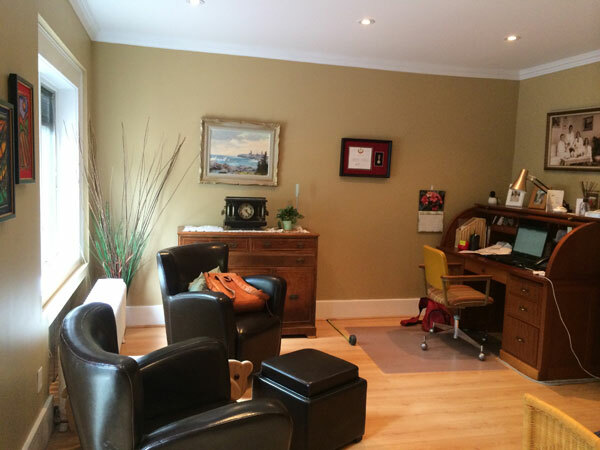 We can consult with you, source items, and make the process a lot less stressful. If you are feeling dissatisfied with your present home, but don't want to move, we can help you find solutions to problem areas, and generate ideas that will help you love your home again. 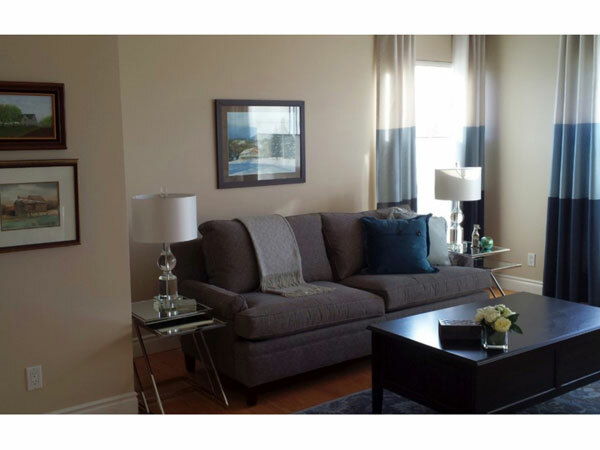 Need help selecting colours for one room or a whole house? Call us! We can help. 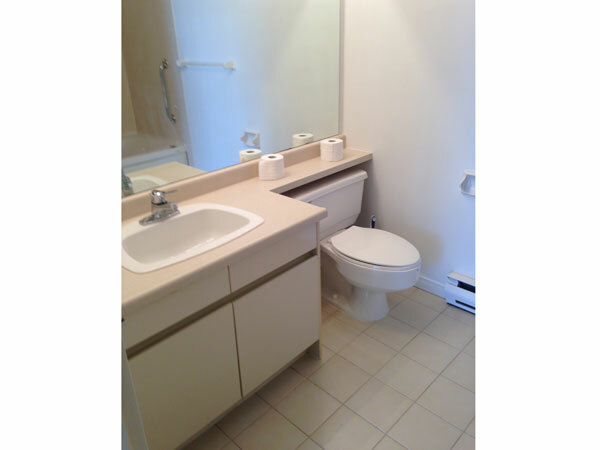 AFTER - This is the second bathroom we have done for these clients. 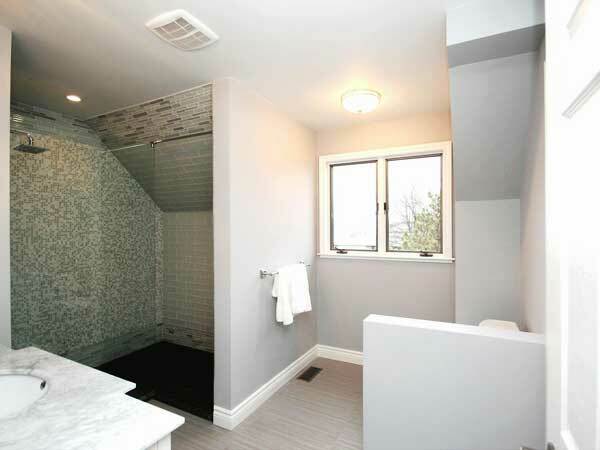 They wanted a large walk-in shower with a clean and open feel. AFTER - The budget allowed for new drapery rods and drapes, and a beautiful Surya rug. 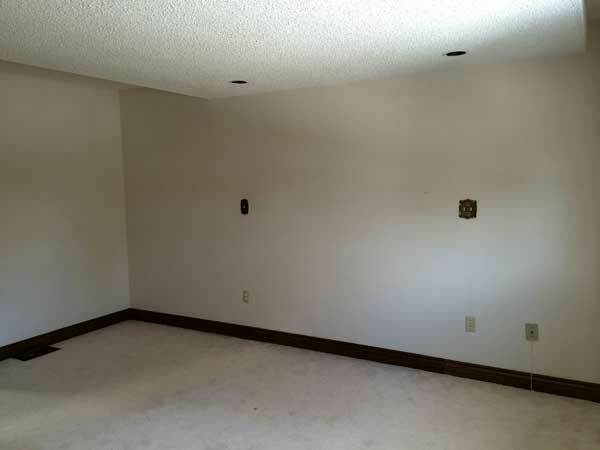 We removed popcorn ceilings, made them flat and painted the main area. AFTER - A great view to wake up to. AFTER - With the wall removed, our new kitchen design was installed. 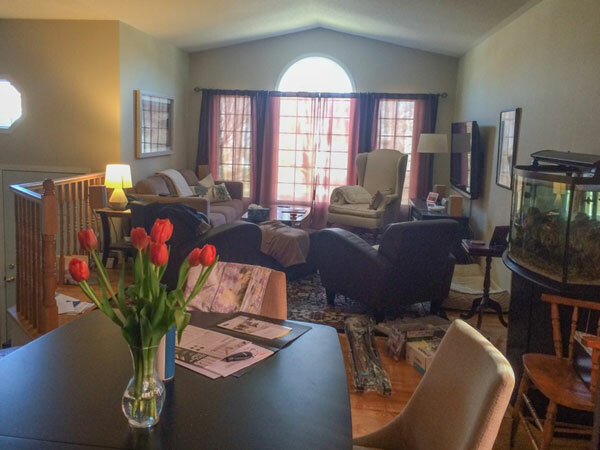 This has become a favorite room for our client to entertain. It's large, bright, and very functional. AFTER - As part of the kitchen design a wonderful large island was added. 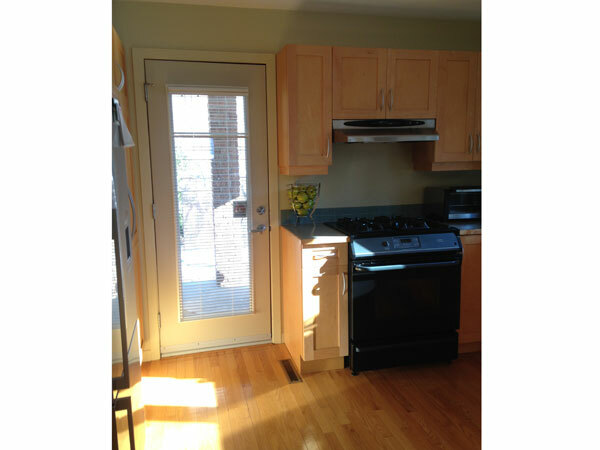 We also expanded the size of the exterior doorway, and added two new patio doors. 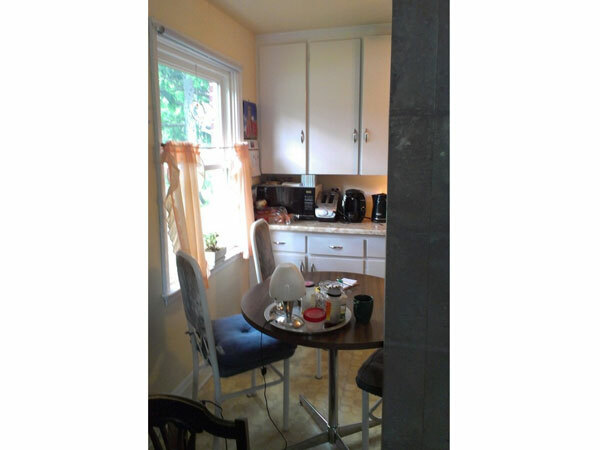 The window was adjusted to allow lots of light, and great views to the garden. 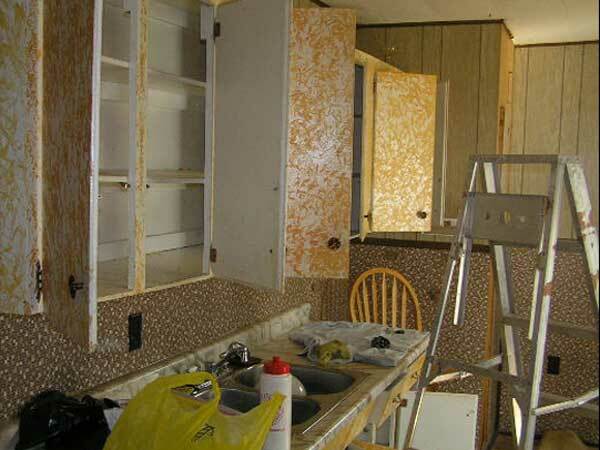 AFTER - The kitchen is almost complete - a new back splash, desk chair and stools are still to come. 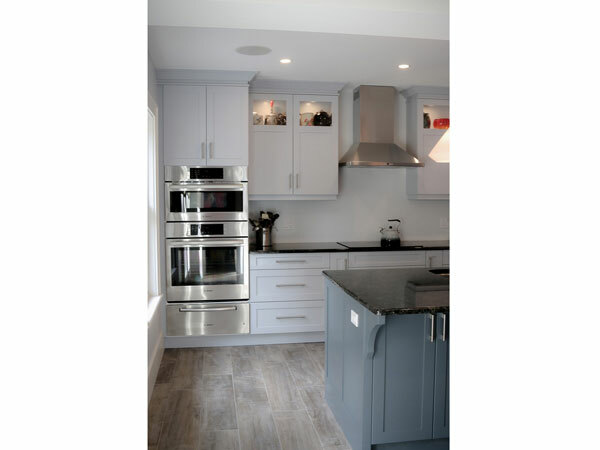 Our client describes this design as having created her "dream kitchen". 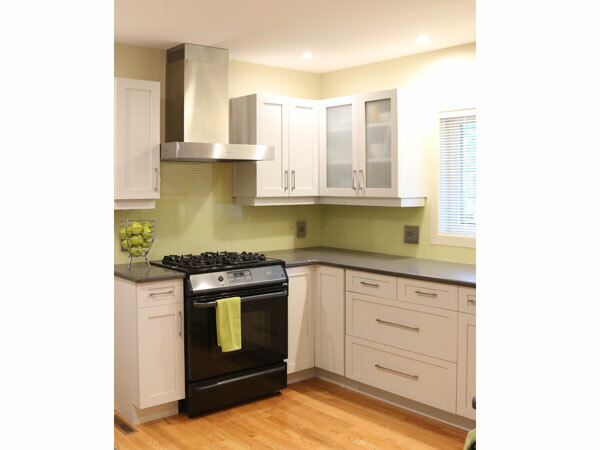 AFTER - We had the cabinets sprayed and then added a new glass back splash in a lovely shade of green, a new range hood, hardware, and a quartz counter top, the kitchen takes on a new look. 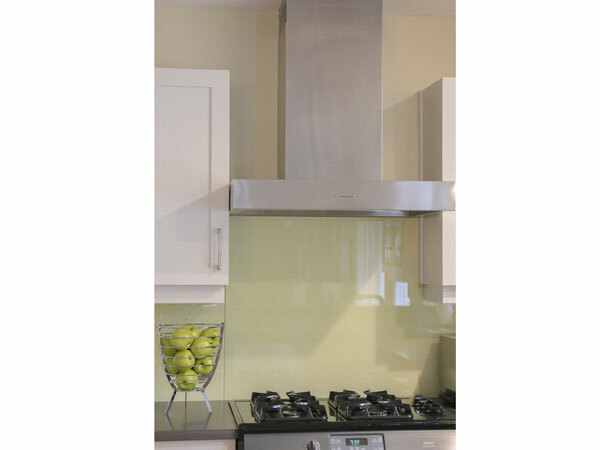 AFTER - The new glass back splash and the sleek hood are welcomed additions. 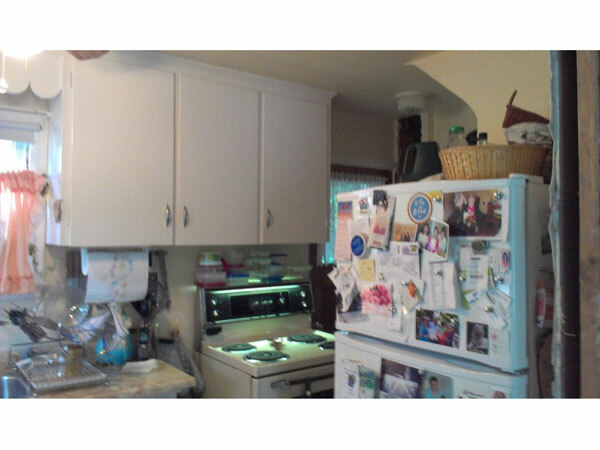 AFTER - We reconfigured the cabinet and added a microwave with a trim kit, for a much nicer look. 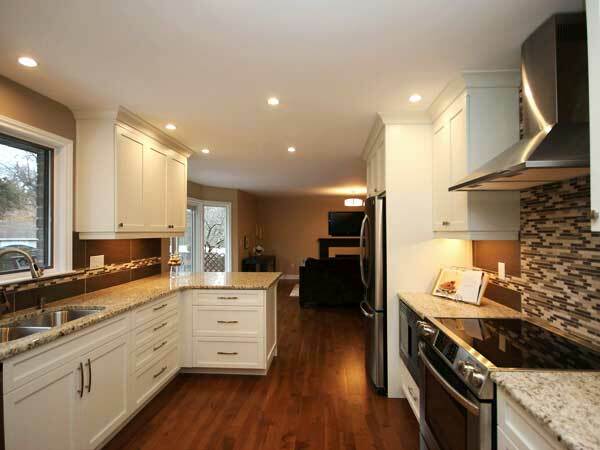 AFTER - Beautiful additions - new electrical covers, and a glass back splash add to the look. AFTER - Another view of the kitchen. AFTER - The client was young and starting over. She wanted something fresh and comfy and not too feminine. A place where she could relax, watch T.V and curl up with a book. 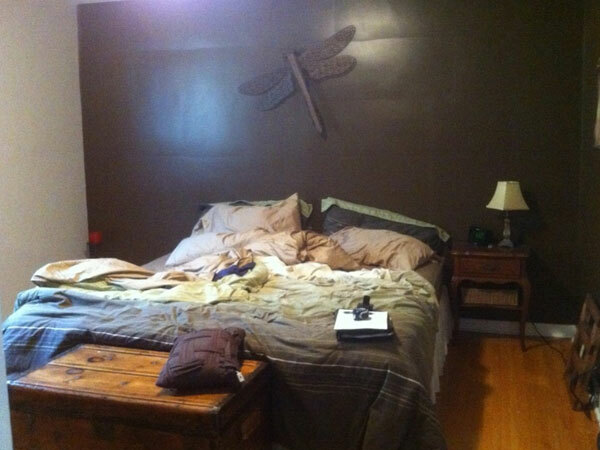 Not shown on the wall at the foot of the bed is a comfy chair for reading and a T.V over a new electric fireplace. 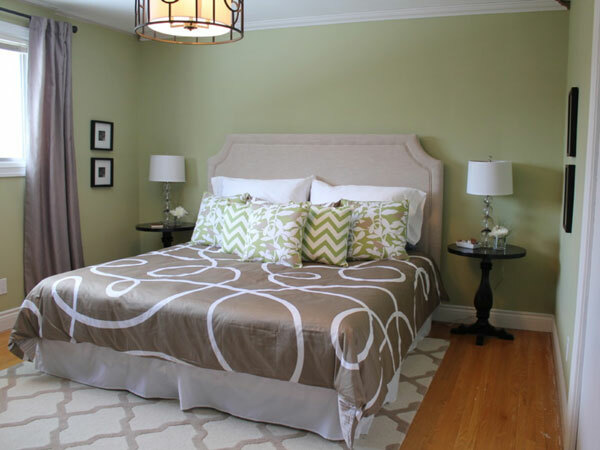 The client is loving her new bedroom. 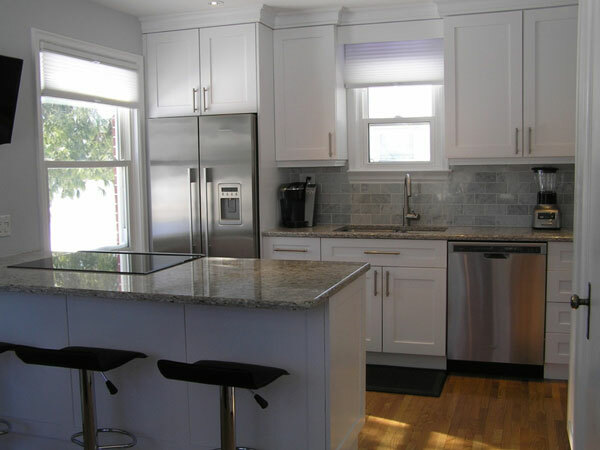 AFTER - With the wall removed we were able design a kitchen that adds more storage, sunlight and an eat-in peninsula. The peninsula sits where the wall used to be. 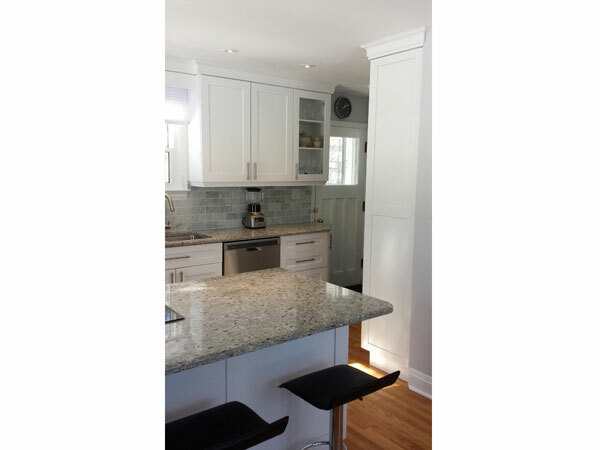 Granite counters (grey tones) add a great work space. 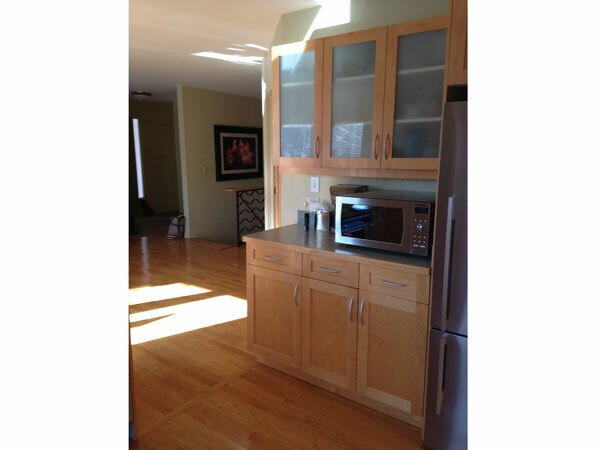 AFTER - The kitchen is now bright, open and the new hardwood floor looks great. 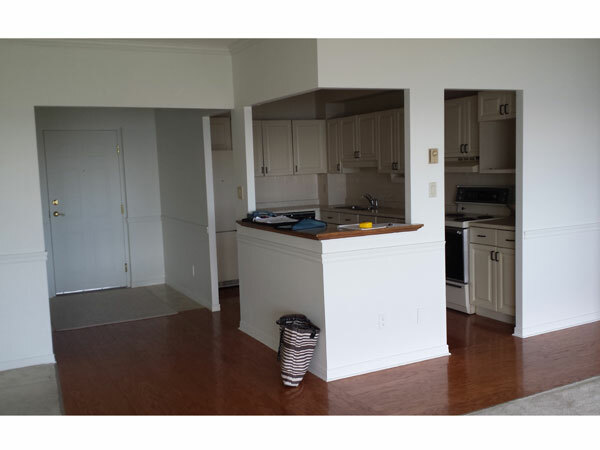 The layout works well for cooking and entertaining. The eat-in peninsula gives a place to relax and enjoy a glass of wine while chatting with the cook. 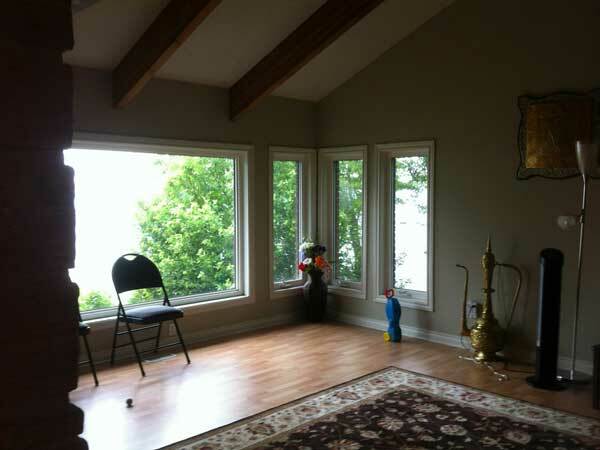 AFTER - The walls were removed to create a larger open concept area and allow a view of the lake. AFTER - Amazing what a new floor, vanity and toilet does to make the space feel more contemporary and reflect our client’s style. 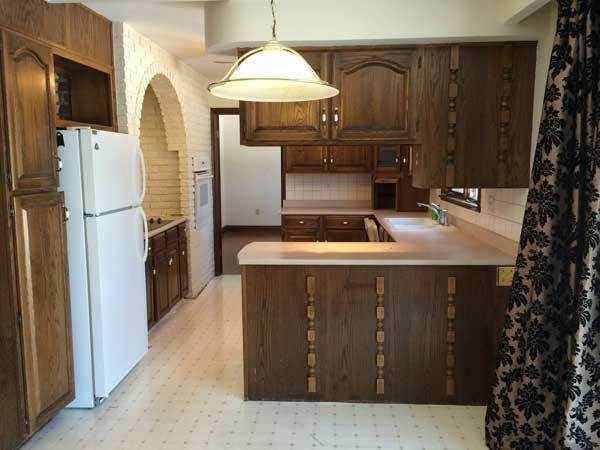 BEFORE - Time to update this home. AFTER - We purchased furniture that had simple modern lines to finish off the rooms. The clients are thrilled with their new lake-front home. 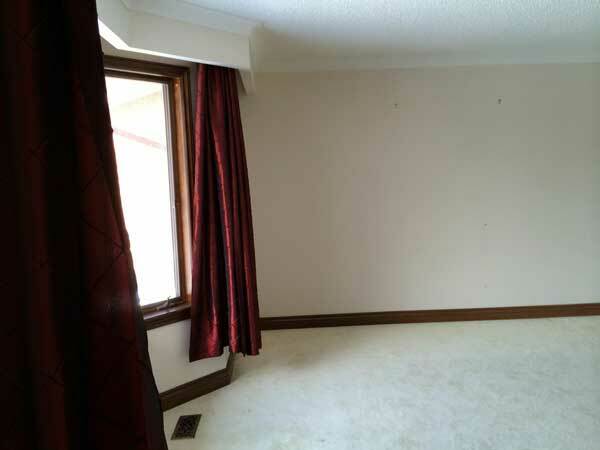 BEFORE - This room’s furniture layout wasn’t working. 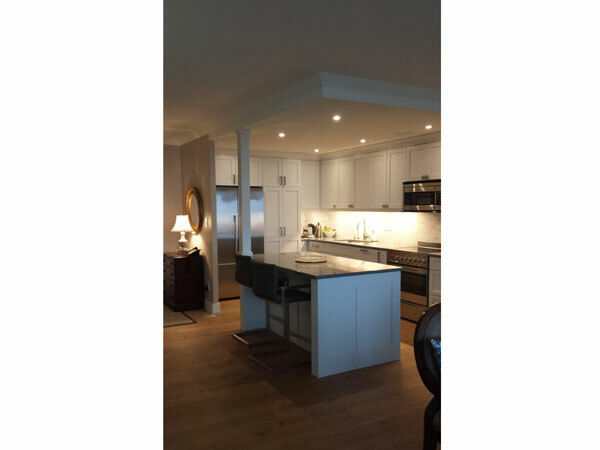 AFTER - Our client requested a calm, minimalist decor. We started by painting out the wooden beams and adding a calm blue-grey paint to the walls that blends beautifully with the lake. The fireplace was updated with a deep-charcoal paint. 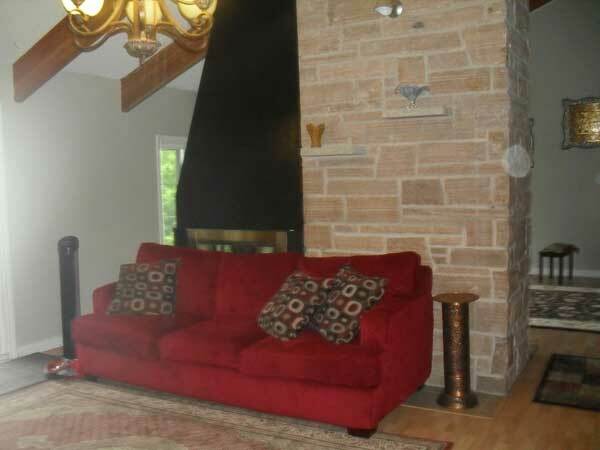 Once their budget permits, we suggested changing the flooring and covering the stone on the chimney with large concrete tiles to further enhance the modern look. 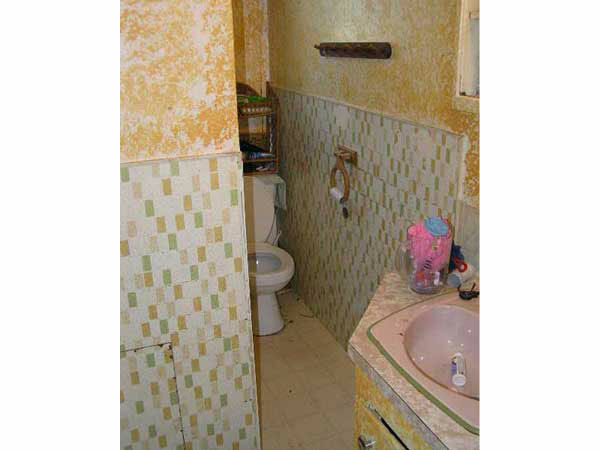 BEFORE - This bathroom needed to be demolished. 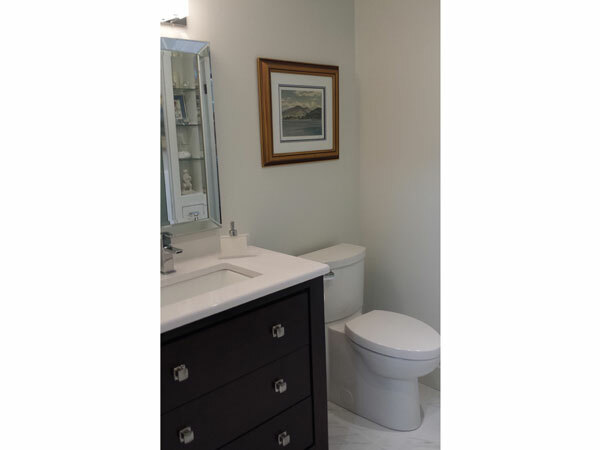 BEFORE - This bathroom didn't work because there wasn't enough space, so we expanded the room by taking a couple of feet from an adjoining bedroom. 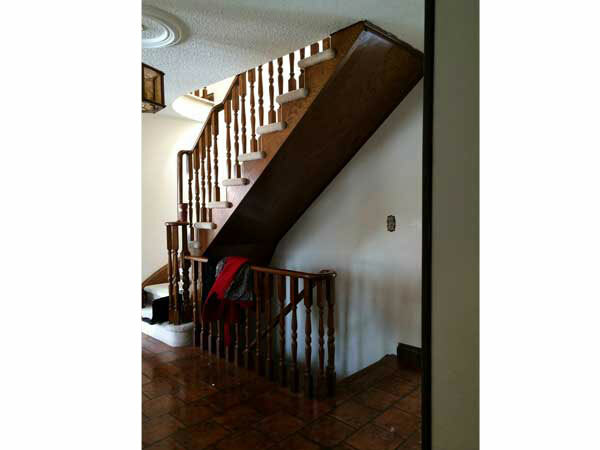 BEFORE - An older home in downtown Kingston needed some features to make it special. 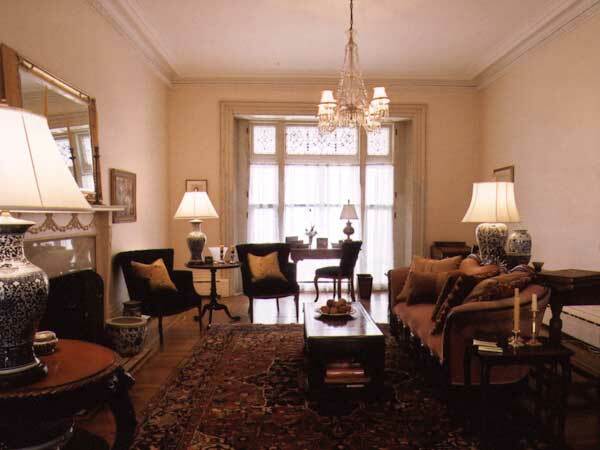 By adding crown molding, an antique light fixture, and a ceiling medallion, we instantly gave the room some interest. AFTER - Next I selected a gas fireplace and had the wall built out to make the fireplace look like an original. 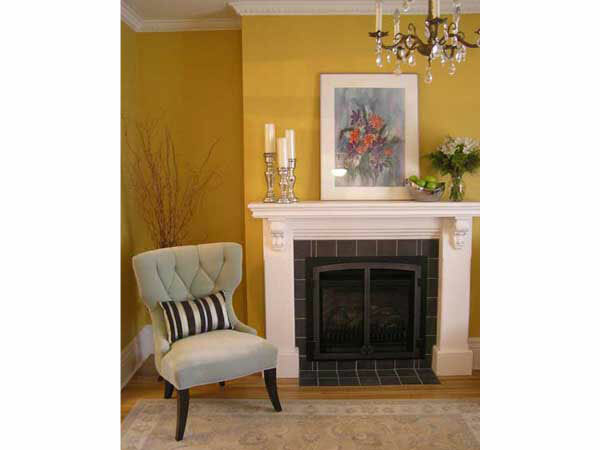 I then designed a mantel piece and had a carpenter build it – a wonderful finishing touch. 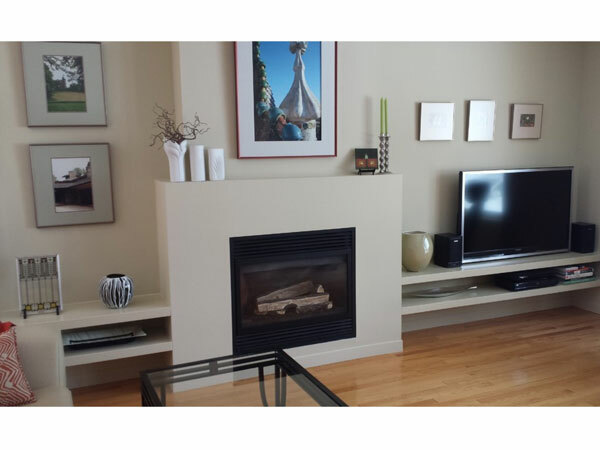 Everyone thinks the fireplace and details have always been there – just the look we wanted. 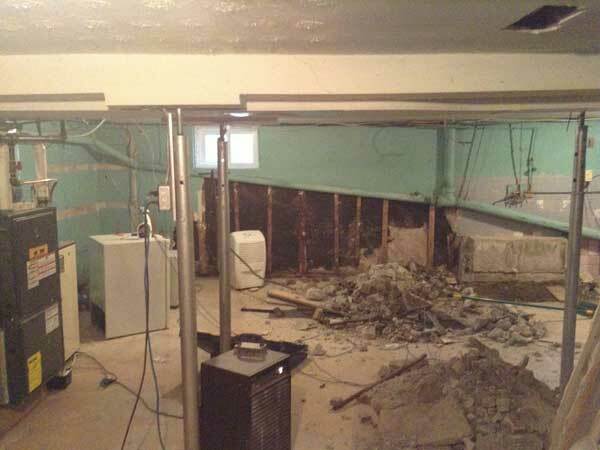 BEFORE - We were contacted by a client living in Switzerland who needed our help to do a complete renovation of his home in Kingston. Through Skype, emails and phone calls, our long distance relationship worked very well, turning a tired-looking house into a home to be proud of. 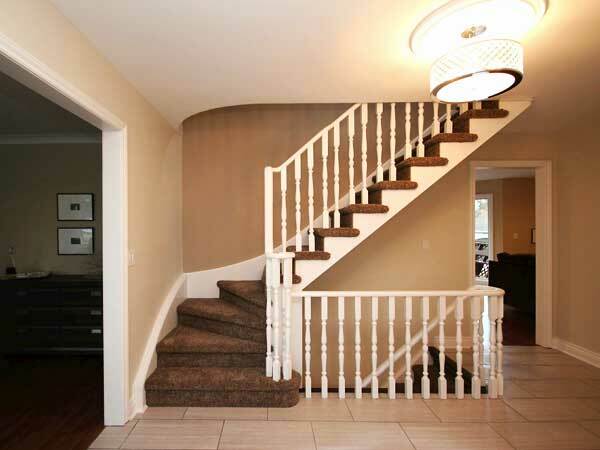 AFTER - The stairway and all trim were updated with a coat of creamy white paint, new carpets, light fixtures and other details to create a lovely First Impression. 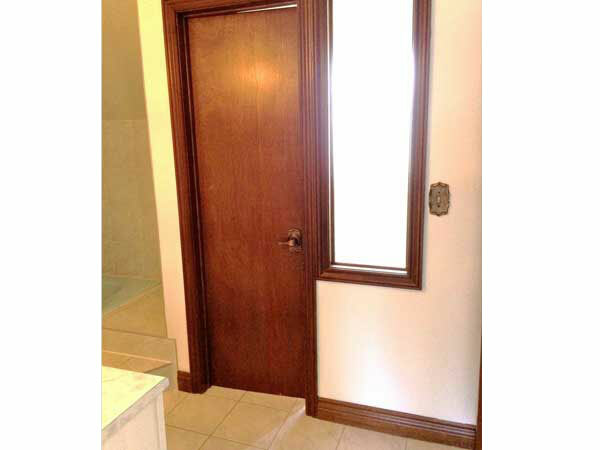 BEFORE - We replaced light fixtures, and dark, outdated doors throughout. 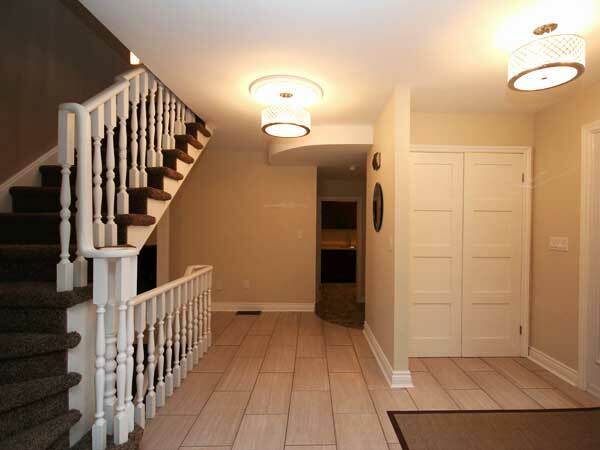 AFTER - The entrance area was brightened up with drum lights, and a new door that incorporates a full side light. The porcelain floor-tiles are a cinch to maintain and the new shaker-style closet doors make it easy to find a place to hang guests’ coats. BEFORE - Appears dark and dated. 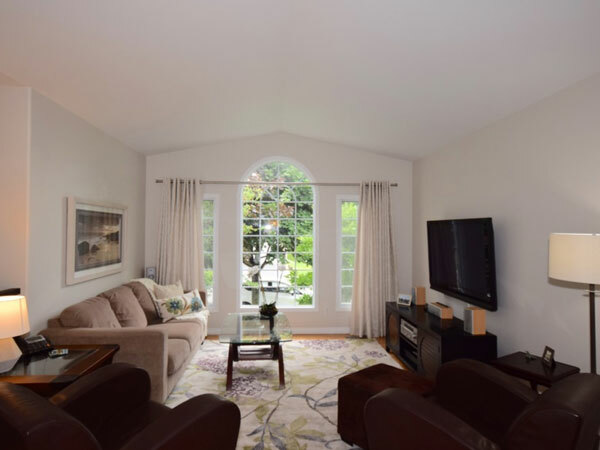 AFTER - The carpet was replaced with new hardwood, all the trim was painted out and new light fixtures were added, making this space brighter and more open. BEFORE - Tired-looking and dated. AFTER - The dining room sparkles at night with the new crystal light fixture. 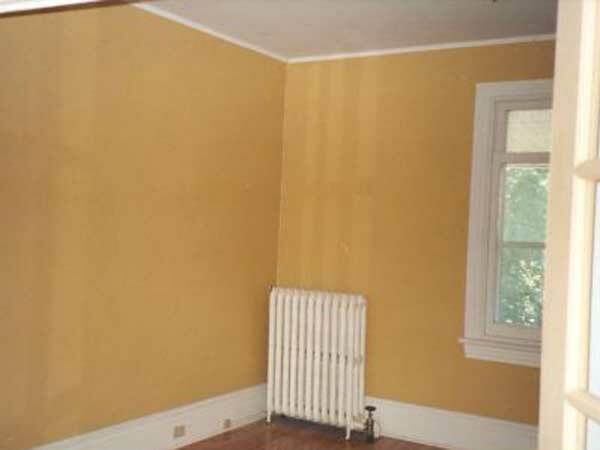 The room was further brightened by painting out the woodwork, and lightening the hardwood floors. 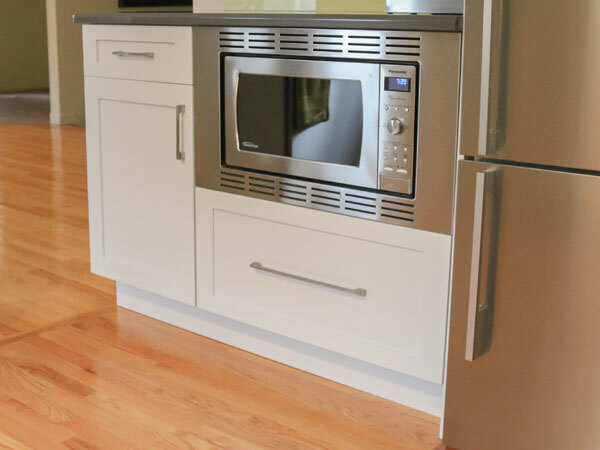 The new frosted-glass shaker door can hide any possible mess in the kitchen from the party prep. BEFORE - The family room’s old ceiling had textured plaster and beams that didn’t add beauty. AFTER - The ceiling has been redone and new flooring and paint were added. A new light fixture was also introduced, along with a deeper stain on the fireplace surround. 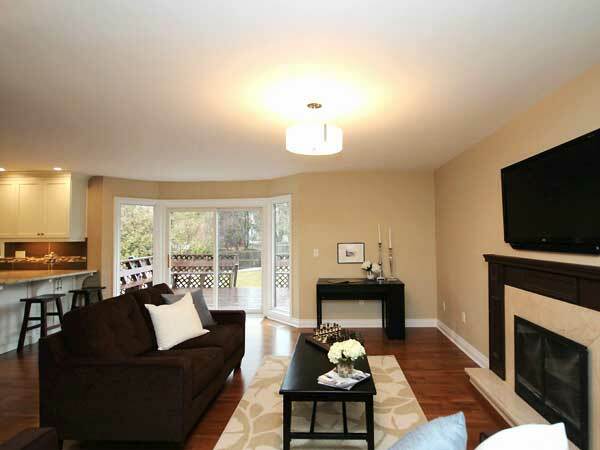 This family room now becomes a favourite place to curl up and relax! 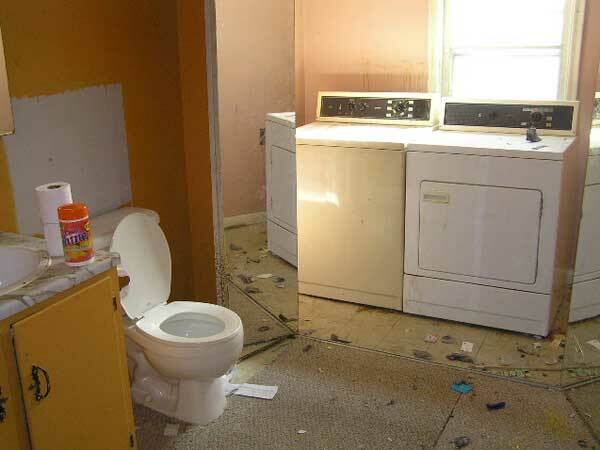 BEFORE - The laundry room is ready for a makeover. 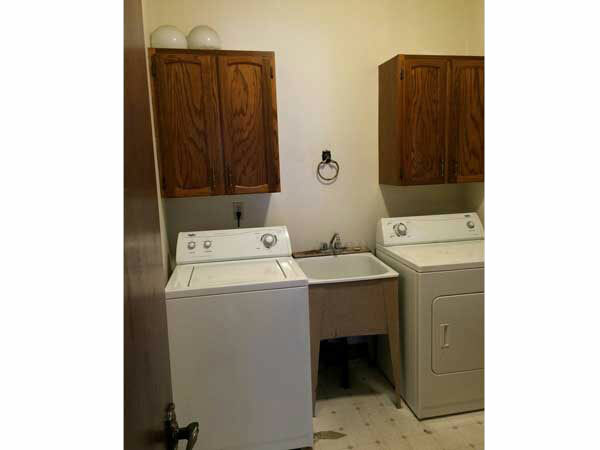 AFTER - With the purchase of a stackable washer and dryer, this laundry room will be complete. 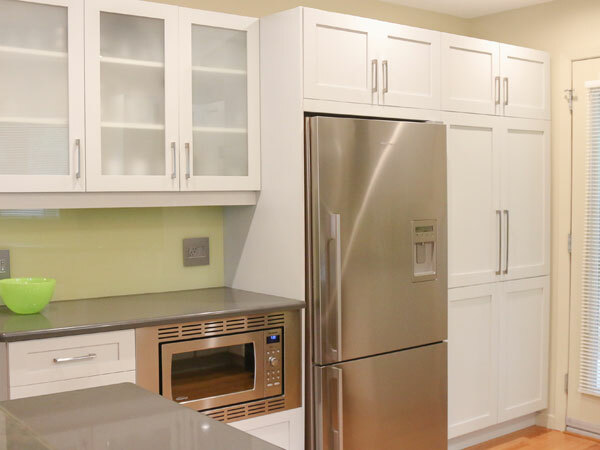 There is now room for storing cleaning products, as well as for sorting and folding laundry. 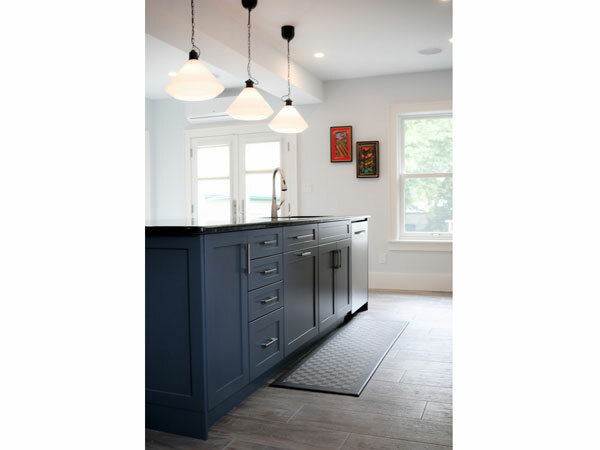 The laundry room also leads to the garage, so we added easy-care cobblestone flooring plus shaker-style frosted doors that can easily be closed when the laundry room is in use. BEFORE - Dark and dated. 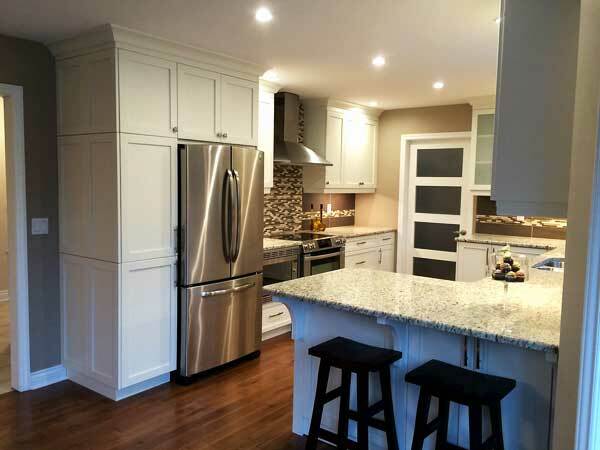 AFTER - A new kitchen design creates a wonderful family kitchen. 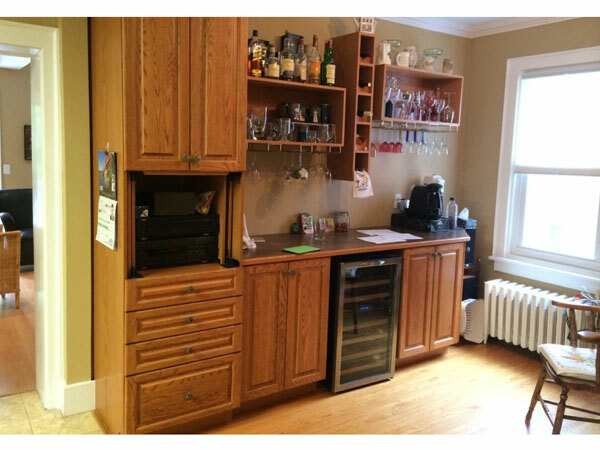 We added cabinets to house children’s craft supplies below the eat-in bar that faces the family room. Now the cook can be preparing meals while the children enjoy sitting at the bar either helping or working on an art project. This keeps everyone happy and out of the cooks’ area! 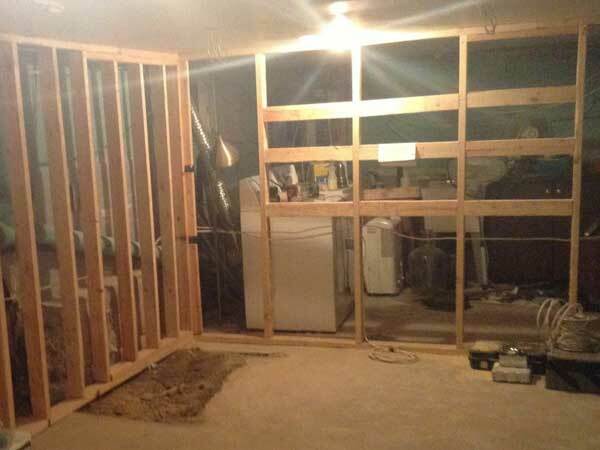 BEFORE - The old brick wall was removed. 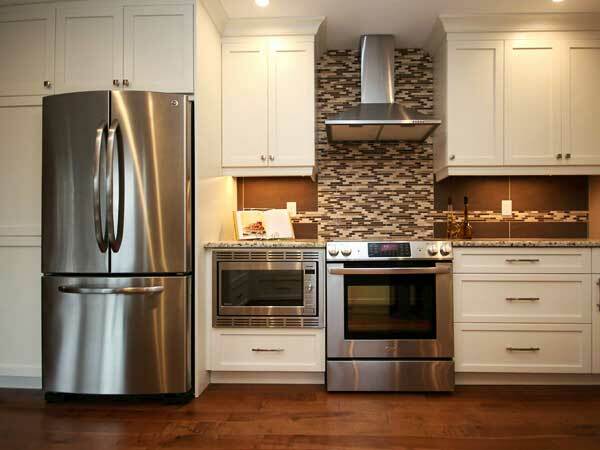 AFTER - Attractive tiles add a nice detail to the new kitchen design. 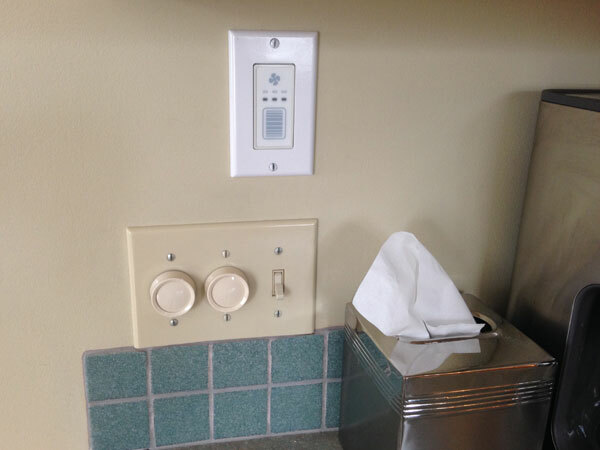 The microwave was positioned so children can help themselves to heat left-overs from the fridge. 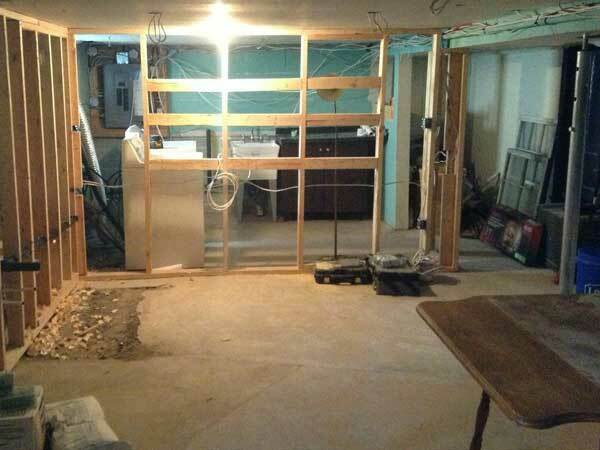 BEFORE - The bulkheads were removed and space reclaimed. 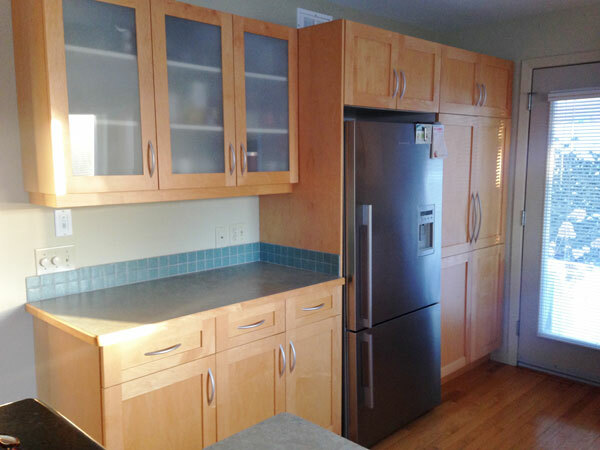 AFTER - With the removal of the peninsula’s upper cabinets, we have gained visual space. Now, when the children or guests are in the family room, the cook is still part of the party. 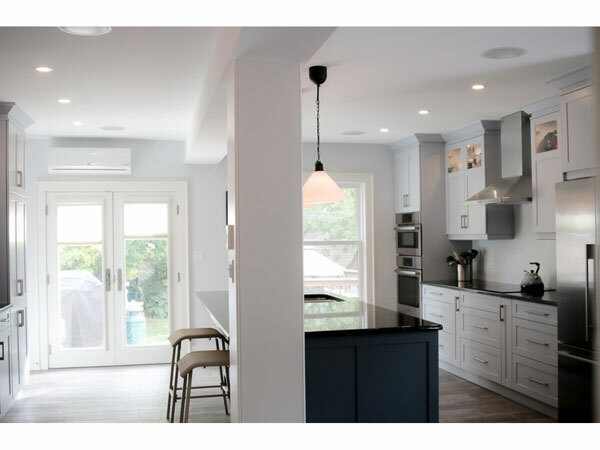 With the addition of pot lights, lots of drawers, a pantry and plenty of working space, this kitchen functions very well for the family. 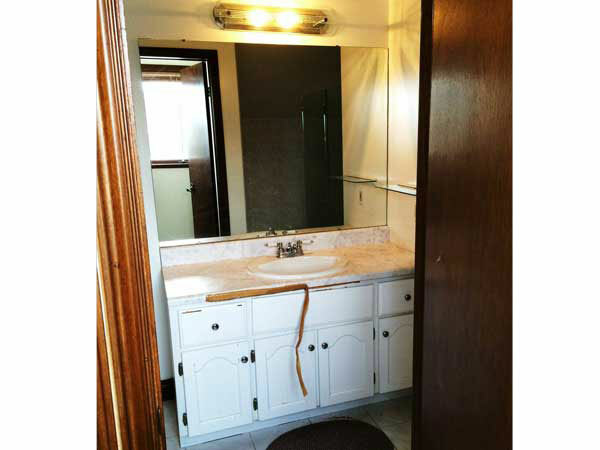 BEFORE - This bathroom was reconfigured to make it more attractive. 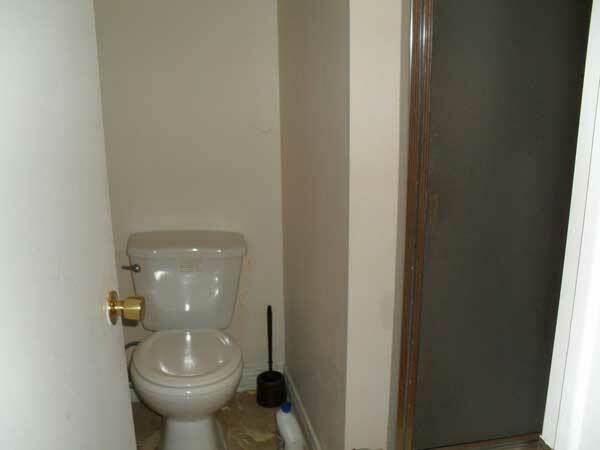 AFTER - The budget didn’t allow us to reposition the toilet. 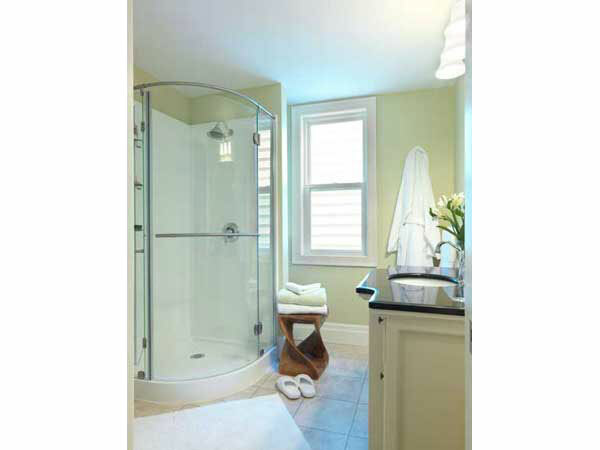 However, to make room for an attractive vanity, we did reposition a new glassed-in shower. 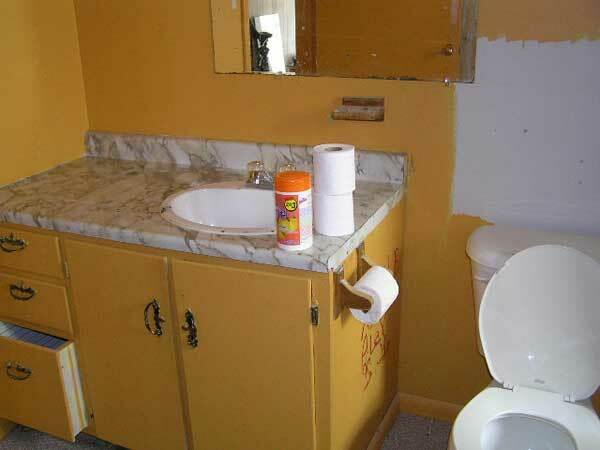 BEFORE - We had fun updating this children’s bathroom. 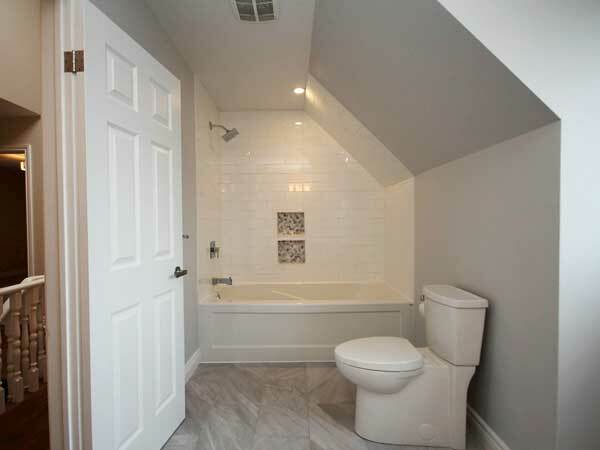 AFTER - We kept the plumbing in the same location to keep the budget down and added a wonderful 6 ft. long soaker tub, perfect for bathing a couple of little ones. 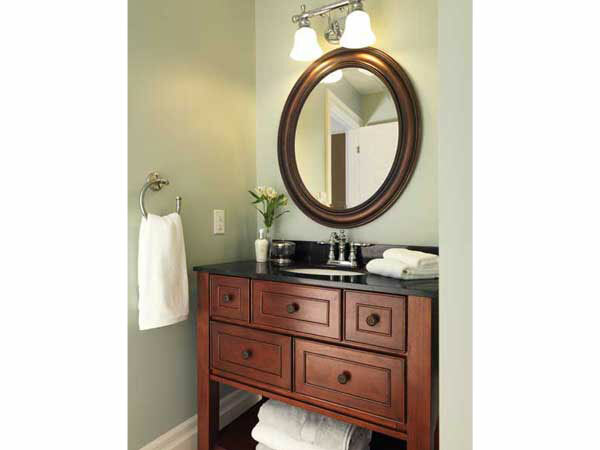 BEFORE - The old vanity was outdated and tired-looking. 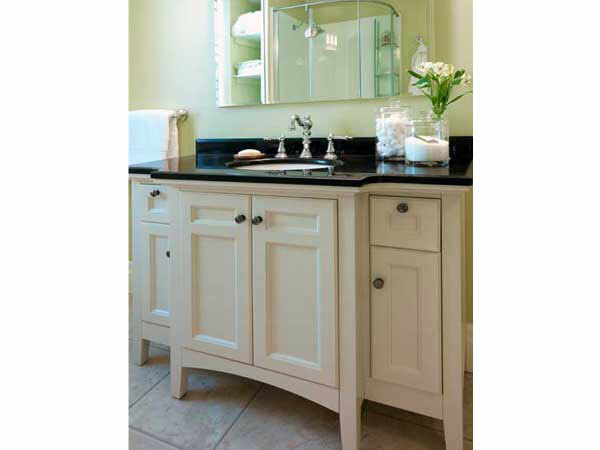 AFTER - A new contemporary vanity with two trough sinks was added to give everyone space to get ready in the morning. 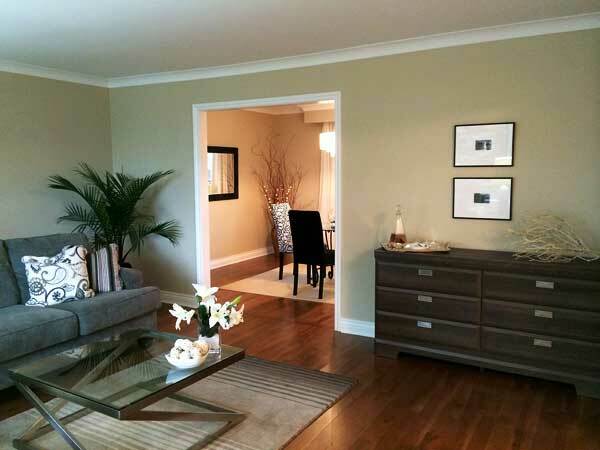 The feature wall provides a great focal point and adds a light, fun note to the space. 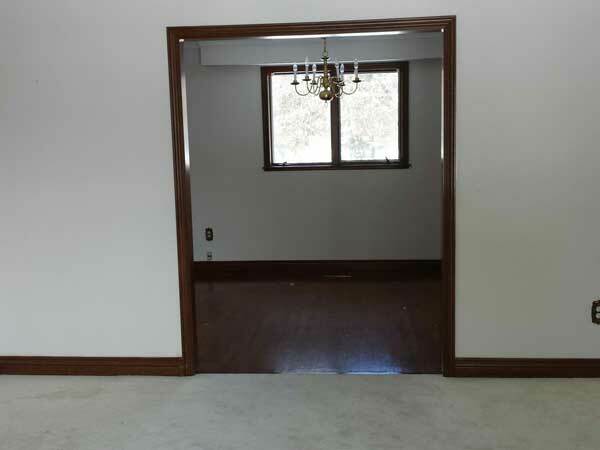 BEFORE - The living room was a nice size but needed freshening up. 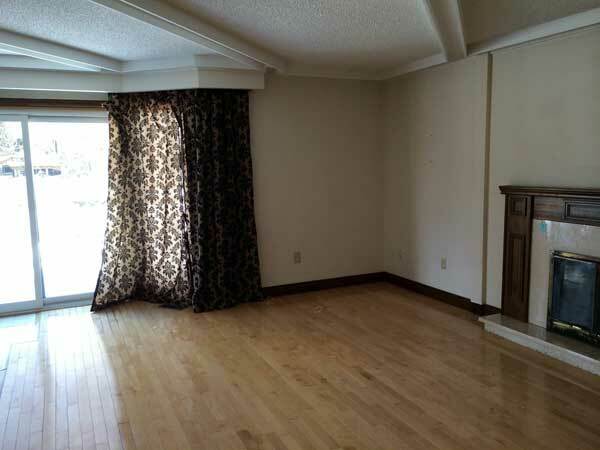 AFTER - With the addition of new flooring and creamy trim the living room looks current and ready for entertaining. 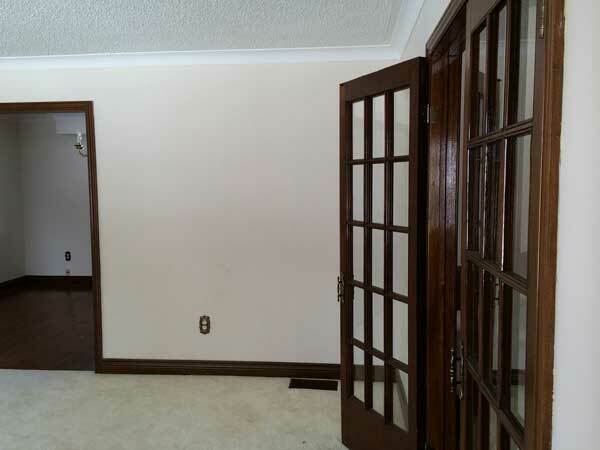 BEFORE - Dark trim, tired paint and old carpet kept this room dated. 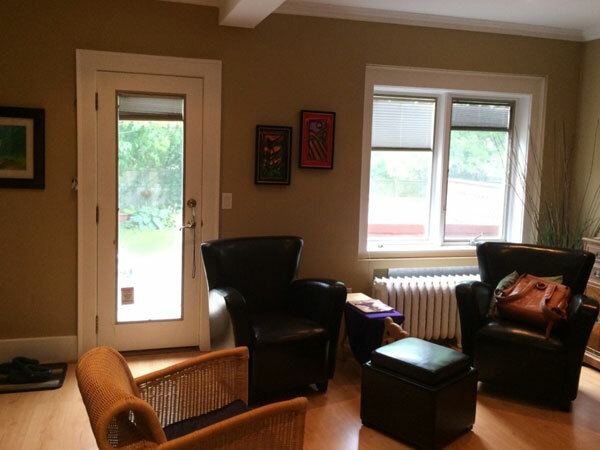 AFTER - The French doors were removed. 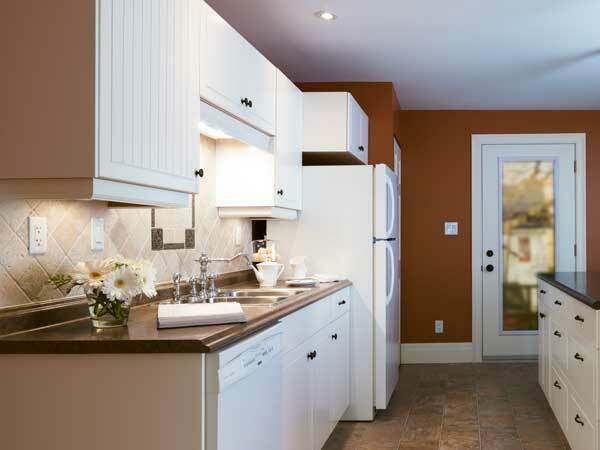 If the family decides they want more privacy, new shaker-style doors can be added later. 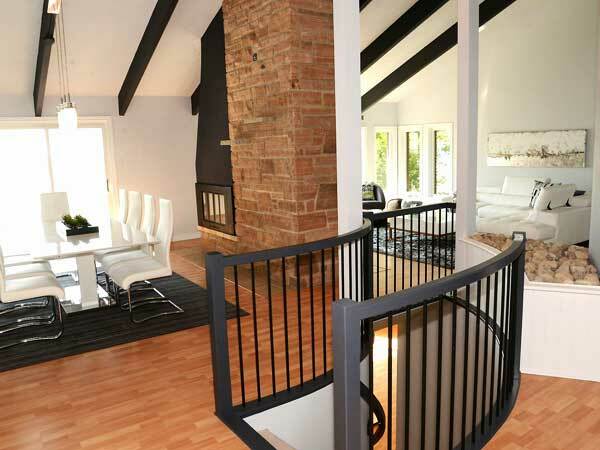 The rooms are tranquil, relaxing and calm, perfect for a busy family. BEFORE - Time for a change. 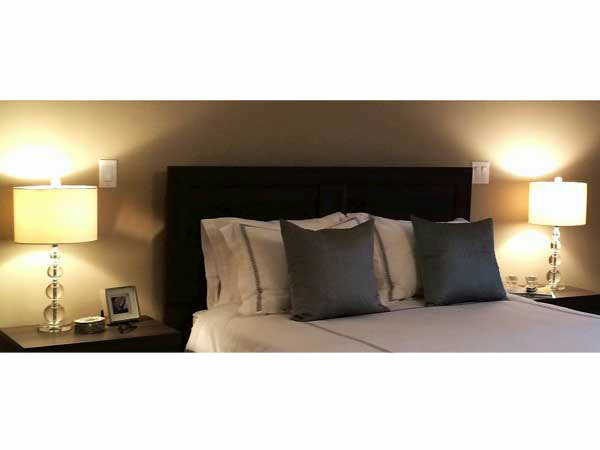 AFTER - With fresh paint, new white electrical outlets, and comfy furniture, the bedroom is ready for the homeowners to enjoy. 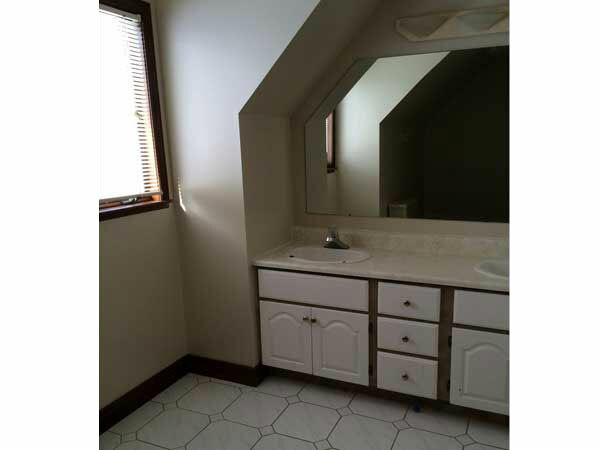 BEFORE - The bathroom had an enclosed toilet room that blocked the lake view and made the room feel small and uninviting. AFTER - With the removal of part of the wall, the toilet remains hidden, but the eye now travels out to the stunning view of the lake, giving the feeling of an expanded space. 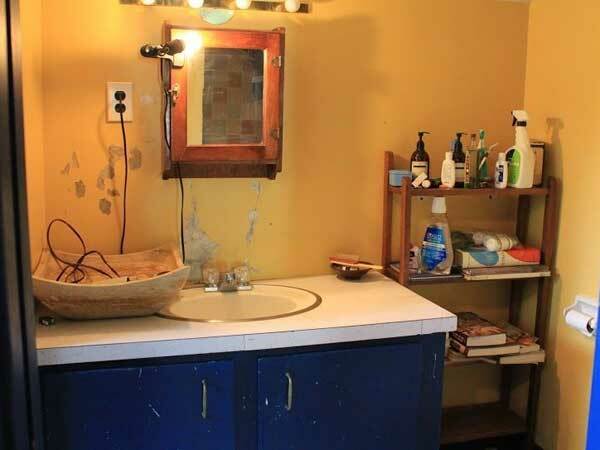 BEFORE - The tired old vanity and flooring say goodbye. 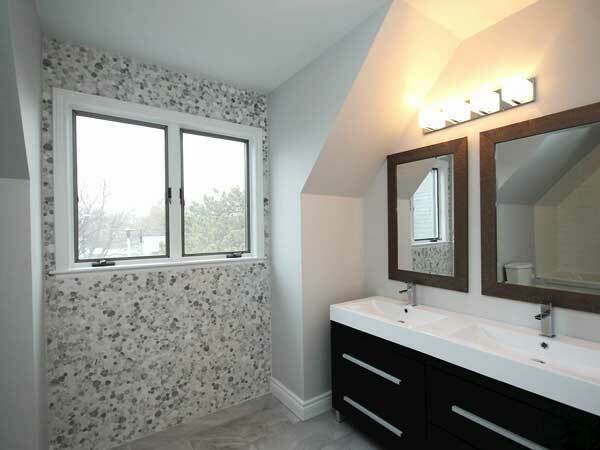 AFTER - With the addition of a marble top vanity, new lights and double closet doors, the bathroom is a lovely place to prepare for the day. 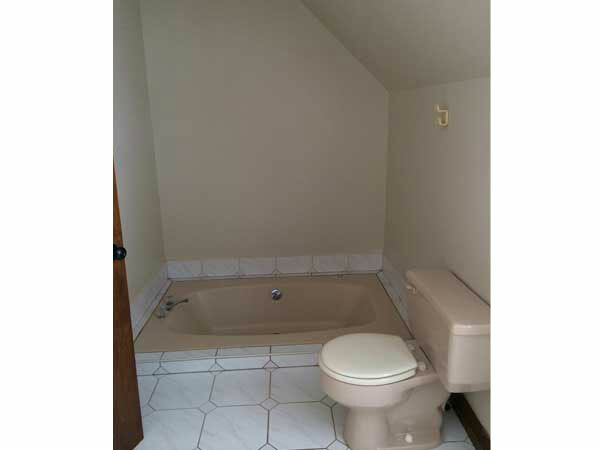 BEFORE - The old step-up tub is dated. 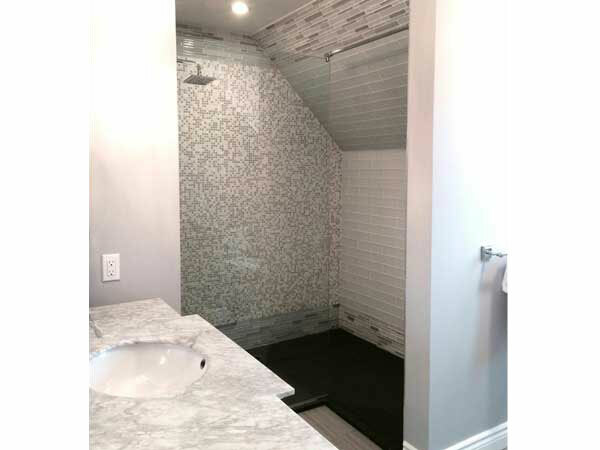 AFTER - We created a lovely large walk-in shower with interesting tile detail for the homeowners to enjoy. The clients flew in from Switzerland when we had the project completed. They were thrilled with the results and took the team out to celebrate. Fun! 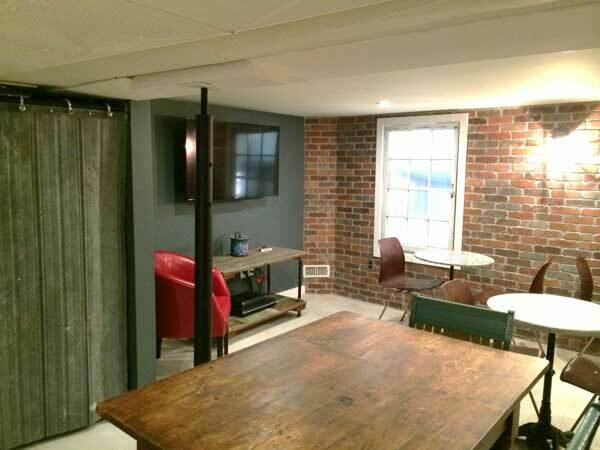 BEFORE - We had worked with these clients before and it was a pleasure to return and help turn their low-ceiling basement into a unique addition to their home. 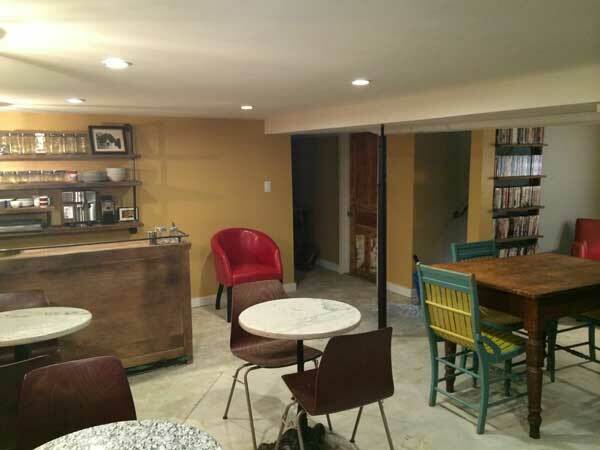 They love cafés and thought it would be fun to create a space where their friends could gather to enjoy films and espresso. 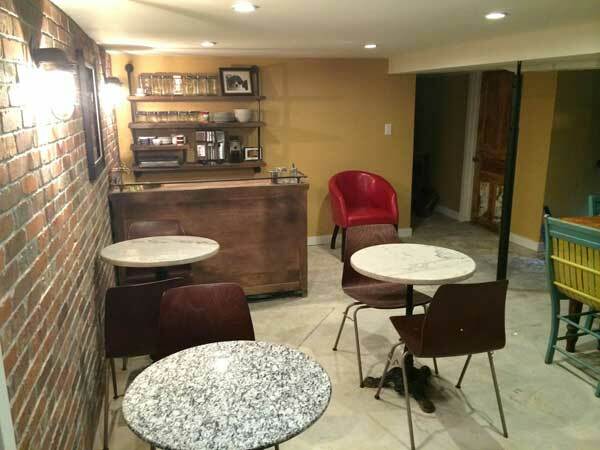 AFTER - Together, we turned a basement into a café, filled with tons of character. 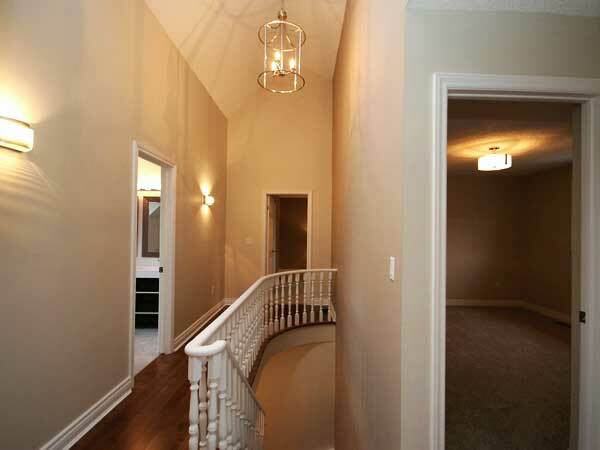 Gorgeous locally-crafted sconces illuminate the red brick feature-wall. We also added and backlit a couple of old windows, giving the sensation of being above ground. 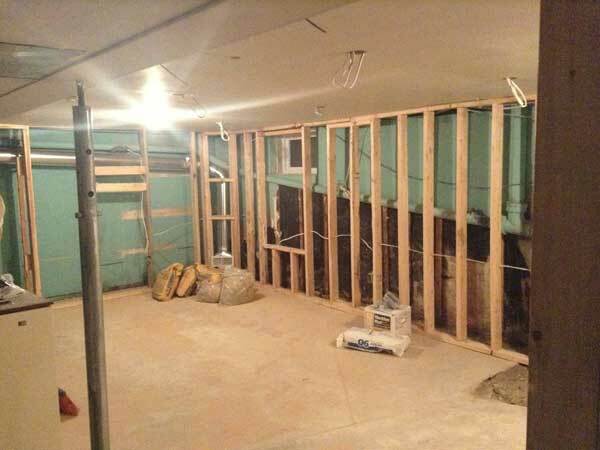 BEFORE - Shortly after demolition and the removal of an old cement sink, the framework for the new walls was built for the café and a laundry room. AFTER - We purchased a cabinet to use as a coffee bar and added a unique antique brass sink. This allows for easier espresso preparation. Behind the bar, we created a shelving unit made from aged wood and several plumbing pipes. Truly unique, and something our client loved! 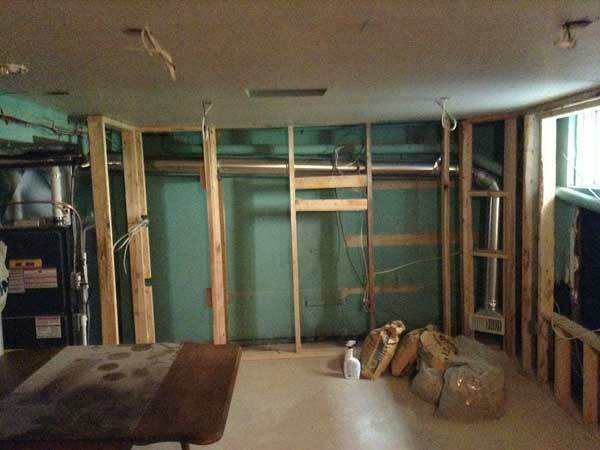 BEFORE - More framework was added to box-in exposed pipes and ducts. AFTER - Two marble-top tables were created from marble off-cut and used with cast iron bases, giving this space the ultimate café feel. Our client found chairs to re-purpose at a local antique shop to allow for plenty of guest seating. We re-used as many materials as we could during the project – always fun to be creative and it’s good for the environment. BEFORE - Demolition in progress. AFTER - Creativity is always a good thing. 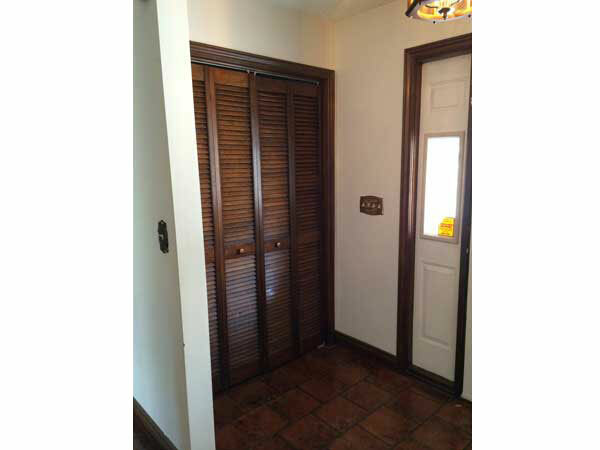 Re-purposed shutters act as doors to a storage room. 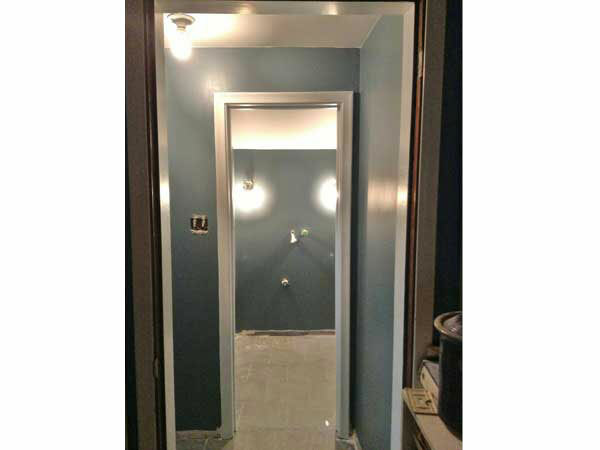 Our client had some old metal sheeting that he thought would be interesting to hang and allow easy access to the furnace. It is in keeping with our industrial feel. 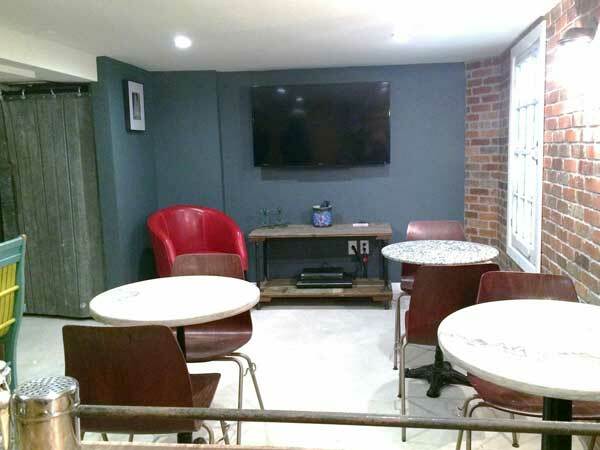 AFTER - To complete this café, a television was wall-mounted with a T.V stand under it. This was created from old boards and galvanized pipes. The space is now perfect for sharing films with friends or just for relaxation while enjoying this one-of-a-kind space. 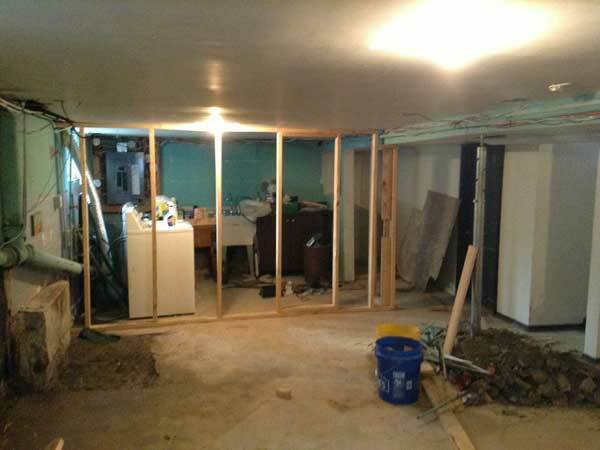 BEFORE - Framework in progress. AFTER - The golden walls add warmth and complement the wood tones of the bar and shelving. The existing concrete floor was patched and sanded to provide an industrial look that will be easy to maintain. BEFORE - Work in progress. 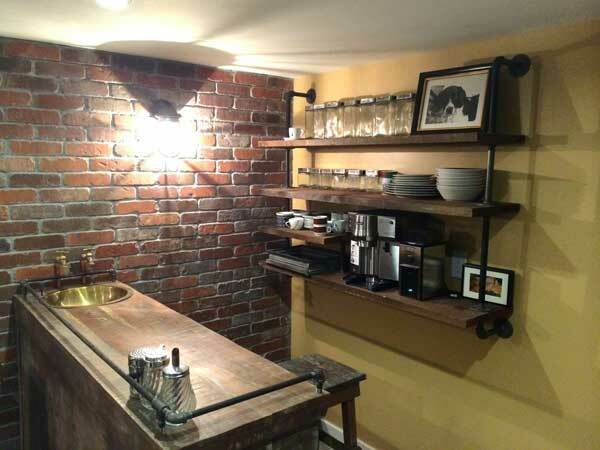 AFTER - Galvanized pipes act as a support for re-purposed wooden shelves and create a barrier around the bar. Instead of using typical taps, we used small garden taps that provide water for the espresso machine. 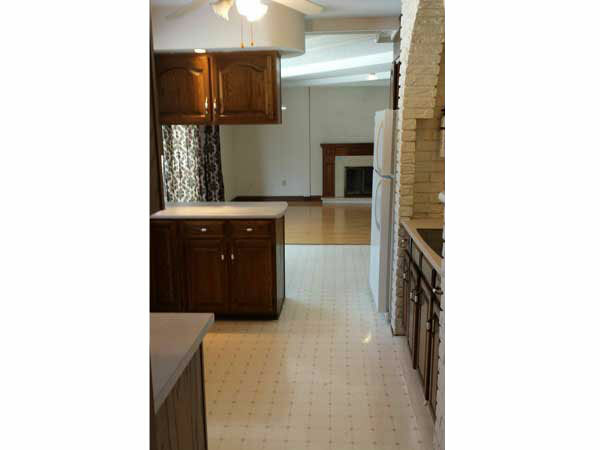 The client was very involved in the project from start to finish. 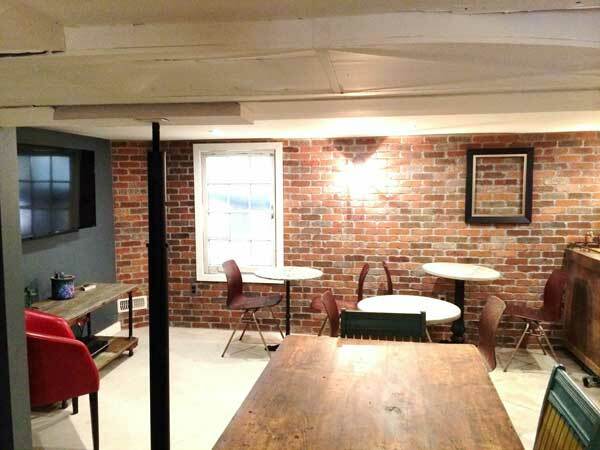 By the end, we had converted a poorly used basement with a low-ceiling, into a café, laundry room and storage area. 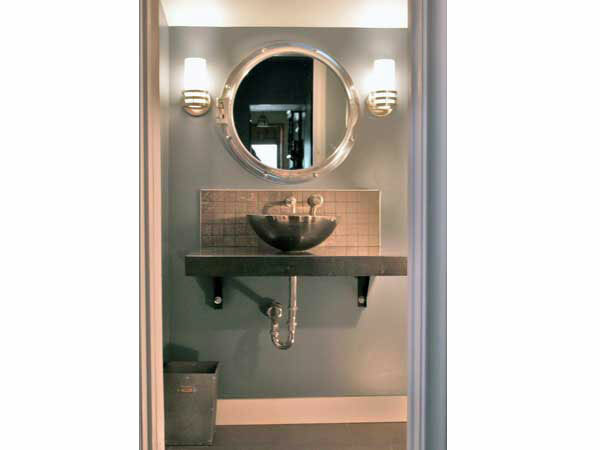 BEFORE - It was time for a bathroom makeover and the client wanted something masculine, unique and with a bit of an industrial flare. 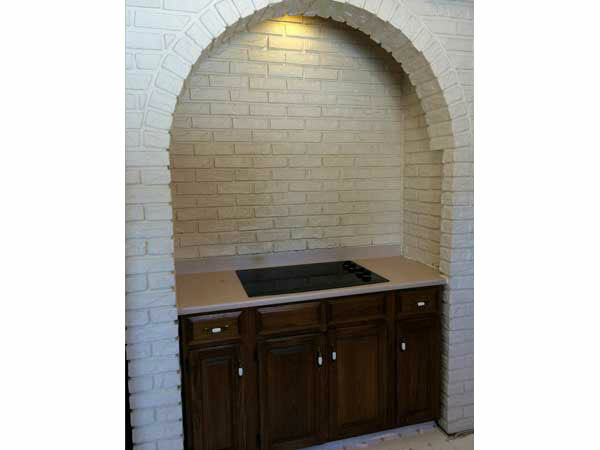 AFTER - We had a concrete countertop poured and mounted on the wall. 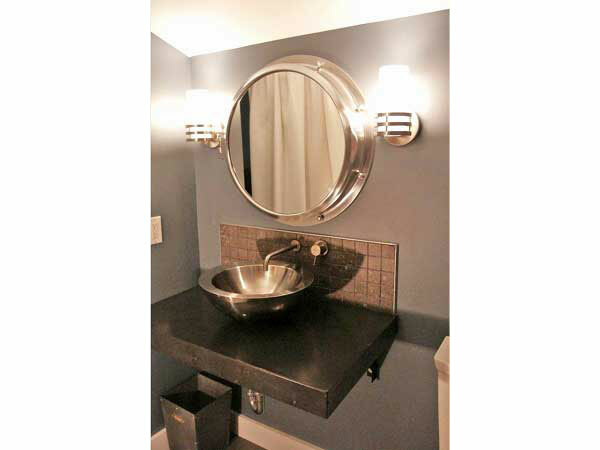 Then we sourced a perfect sink and taps, and ordered a mirrored medicine cabinet that looks like a port hole…we were off to a good start! 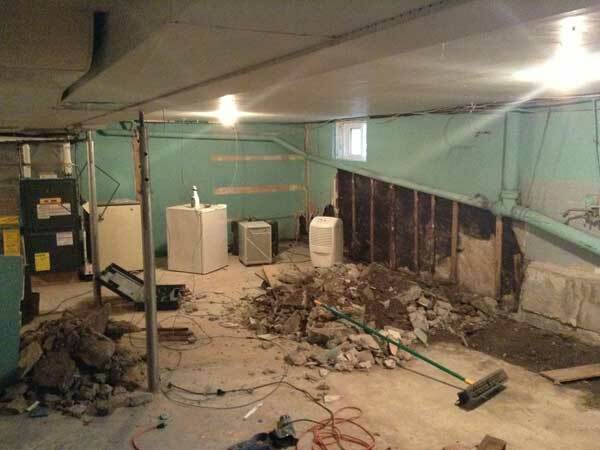 BEFORE - Things are cleared, walls repaired, plumbing and electrical are updated. AFTER - Sight lines are always important to consider. 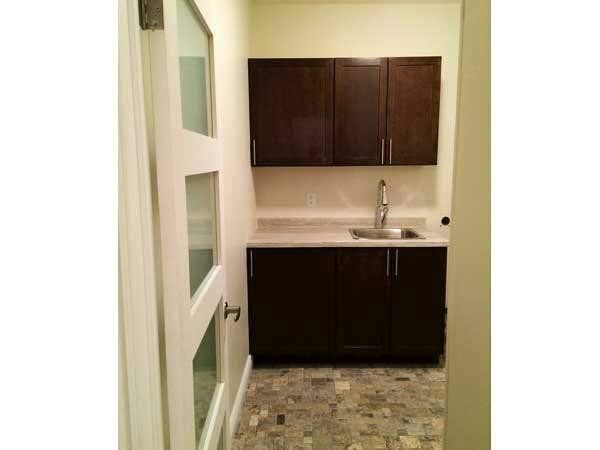 Here, as you enter, you get a great view of the star of the show – the concrete counter and fun medicine cabinet! 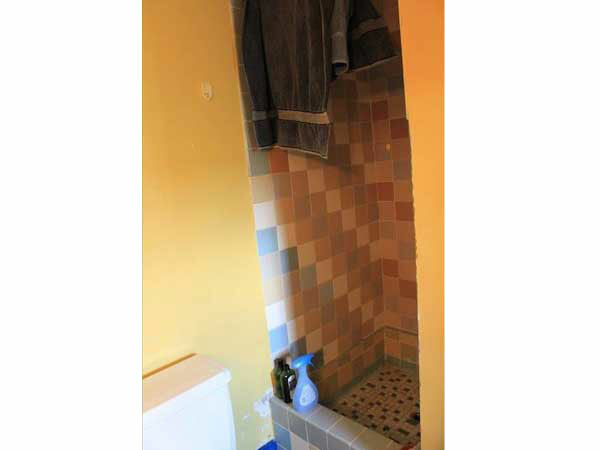 BEFORE - This small shower was in need of a face lift. 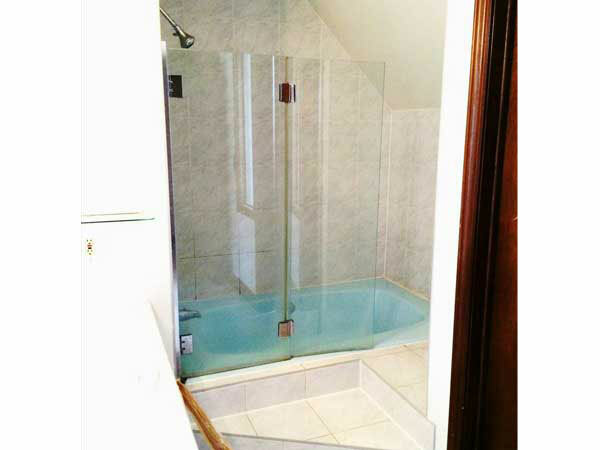 AFTER - Since the bathroom was small, the shower size didn’t change. 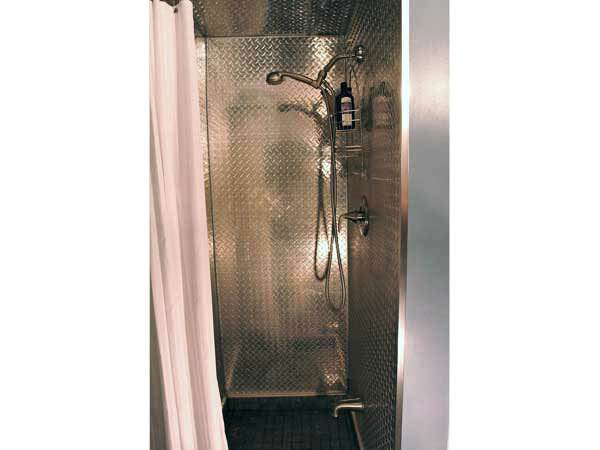 The reflective steel that was used to build the shower walls creates the illusion of more space. 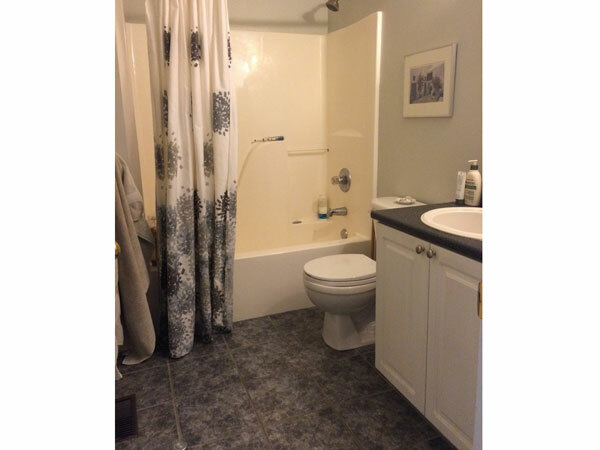 This is a great bathroom for man or dog to clean up (the client has two dogs he loves). 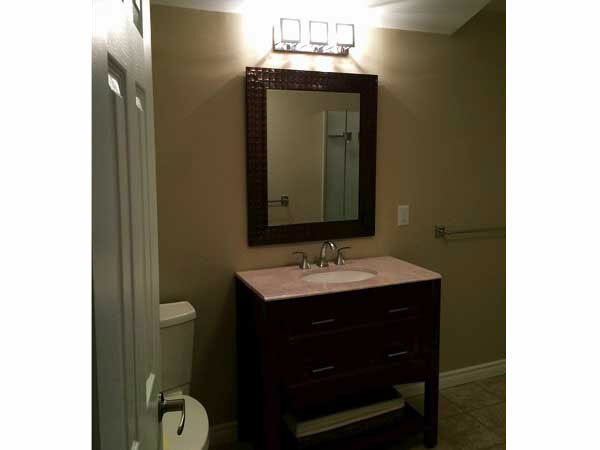 The project was fun and the client was thrilled with the results! 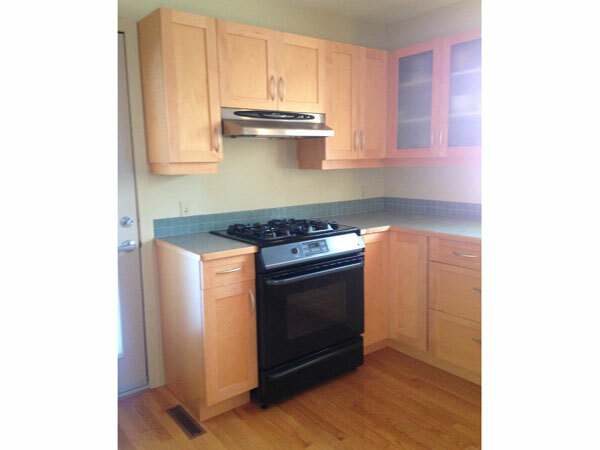 Have you ever dreamed of starting over - new city, new home, new furniture? That's exactly what these clients did. A very fun project to be involved in! 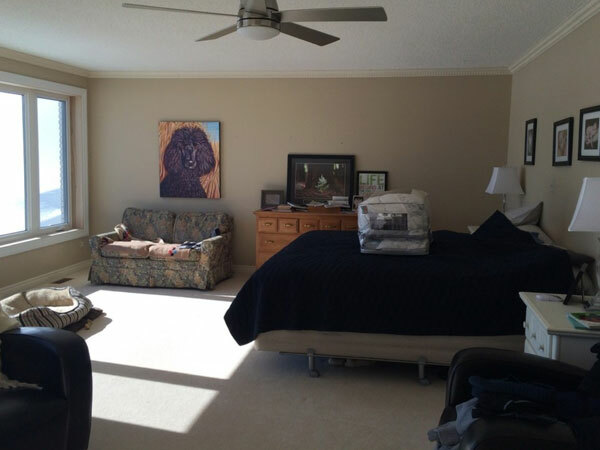 Their new bedroom furniture and accessories were purchased locally with a few pieces of art to get them started. 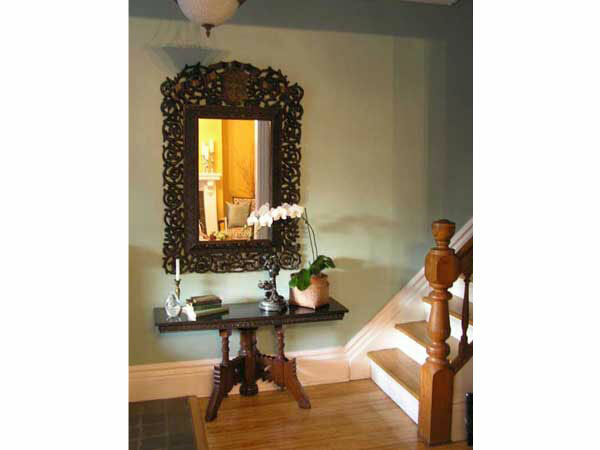 An antique framed mirror takes centre stage to welcome guests. We needed a shallow table so we created something with items the homeowner already had. The top of an old dresser became the table top; we added some old wooden legs to create an interesting hall table. 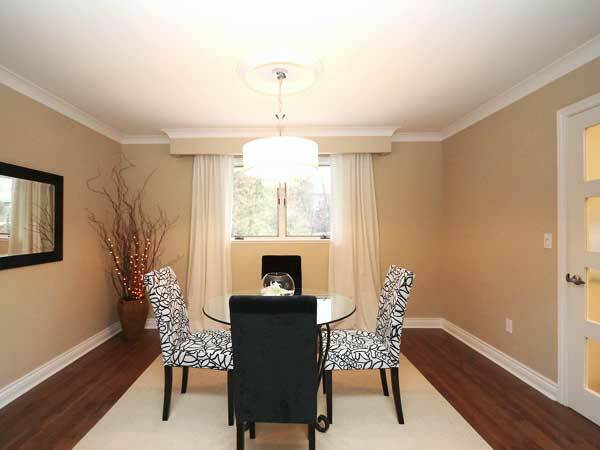 When the homeowner has the budget we will add a new hall light and area rug to finish off the look. 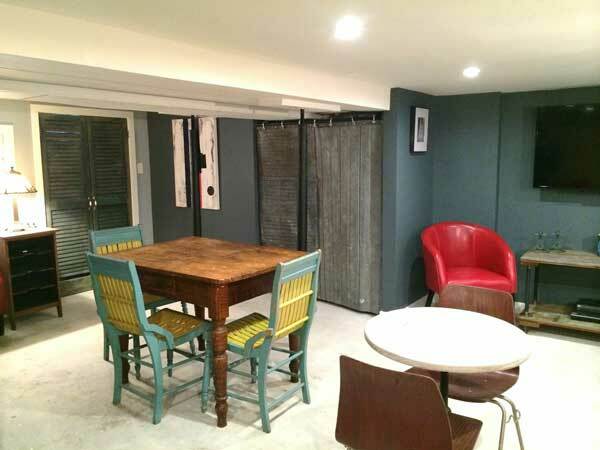 A large renovation which took many months before the furniture arrived. 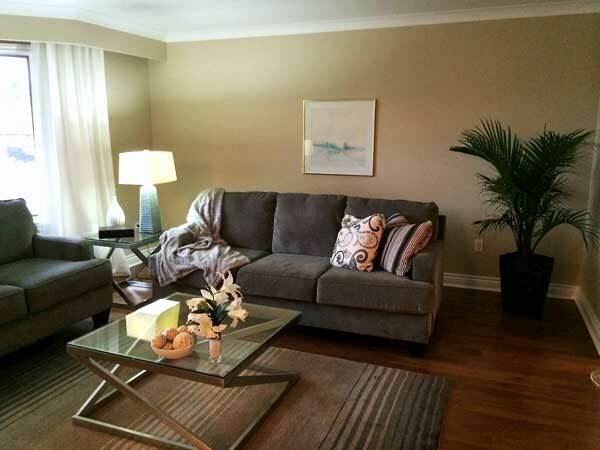 Then the living room was set up to look spacious and welcoming. It is such fun working in these old homes and returning them to their earlier glory! One of the beautiful old homes in Kingston. 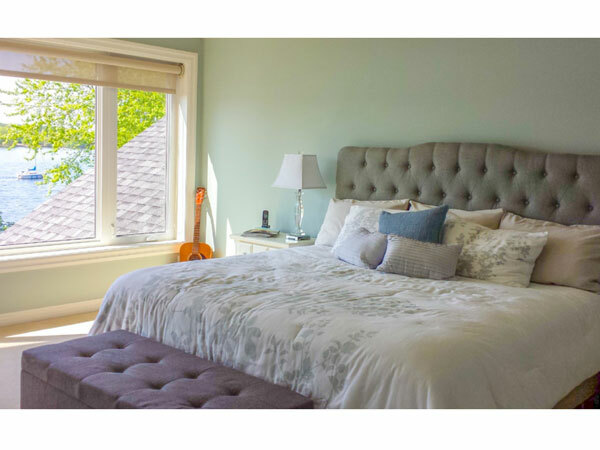 Months and months of hard work paid off turning this home into a wonderful space to enjoy. 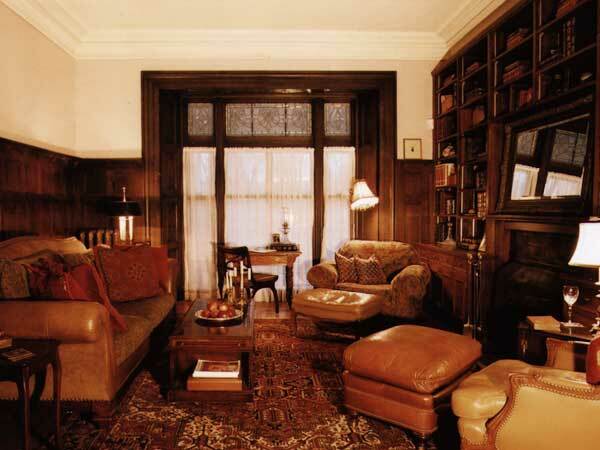 The library was set up using furniture the home owner already had.